My clients all have different personalities! Some clients have more outgoing, extroverted personalities where they do not have any problem meeting people and have more of a problem choosing a good partner for themselves. Then there are more introverted clients that I work with who are more comfortable in smaller groups with people that know and love them. My more introverted clients do not like large crowded events, as well as they tend to need to manage their people focused energy to shorter intervals of time. So how does an introvert date successfully and find true love? 1. Choose activities where you are meeting like minded people with some interest or cause in common. 2. I recommend online dating for my introverted clients because it’s a solitary activity and you are relating on an one on one basis. people will judge you on your attributes and online photo instead of how good act in large groups. 3. Choose groups that are smaller and where people get to know you time after time. Commit to going regularly so you can see someone you may be interested in a couple of times. Your chances are better to making a connection. 4. Offer to help out at an event. Have a role for an event for greater visibility. People will know who you are. You will find that it will be easier to initiate conversation. 5. Drive yourself to an event so you can leave when you want to (or be the driver!). In order to manage your energy – come early to meet people as they arrive and leave when you need downtime. 6. Let people you date know that you enjoy being with people and you also needs your alone time to yourself. The right person will respect this. 7. If you are traveling with a singles’ group, get your own room in the hotel so you have time to yourself when you need it. If you follow these helpful dating tips, you will find you will have more fun and will make successful connections which will ultimately increase your chances of meeting the right one! What are your challenges dating as an introvert? What works best for you for dating and connecting with others for relationships? This curious coach would like to know! PS. 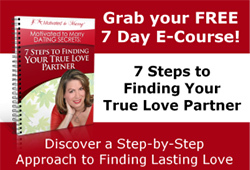 Would you like to discover Coach Amy’s simple dating system to CLARIFY who would be a good partner, FOCUS on how best to meet marriage minded singles and how to CONNECT with lasting love? If so, go to www.TalkwithCoachAmy.com to apply for a Meet Your Mate strategy session. I look forward to talk to you soon! Amy, much of what you say relates to my arena, career development. Recharging of battery, smaller groups, online activity all rings true in the career search. I suppose interpersonal skills correlate between dating and almost every aspect of life. Great post.